This a quick visual list of the things I am using. I plan to keep this updated until this build is complete. Explanations/Testings and such will be carried out throughout the thread as they come up. This is the tote I am using. 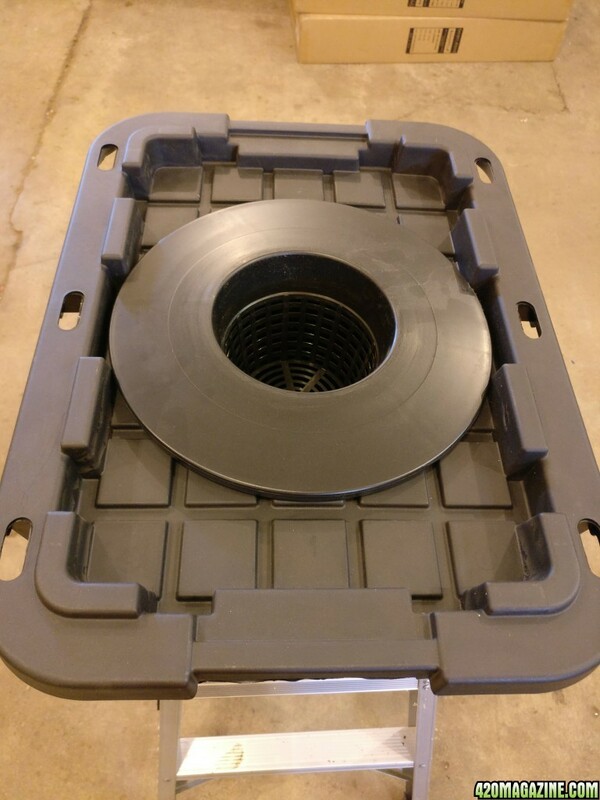 Tote with hole cut for Net Pot. 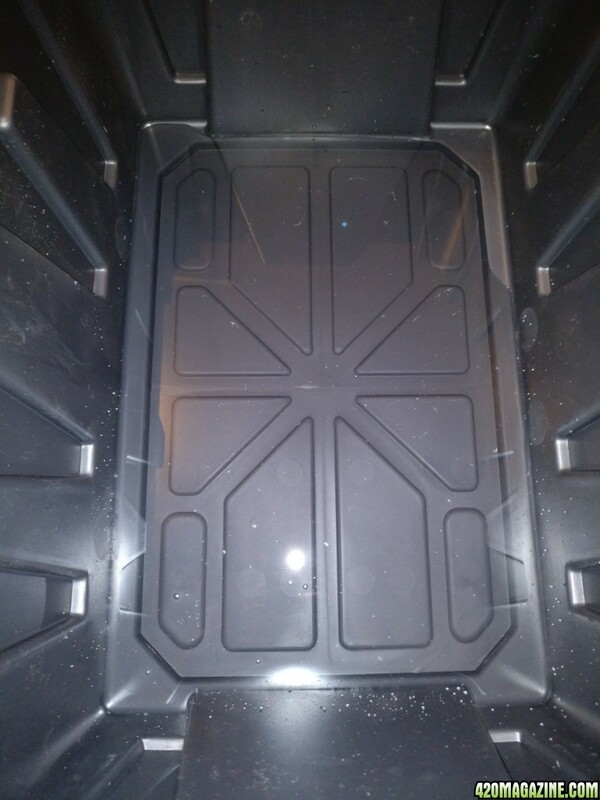 Tote with Net Pot installed. This is what we are comparing with. Here is the Net Pot. 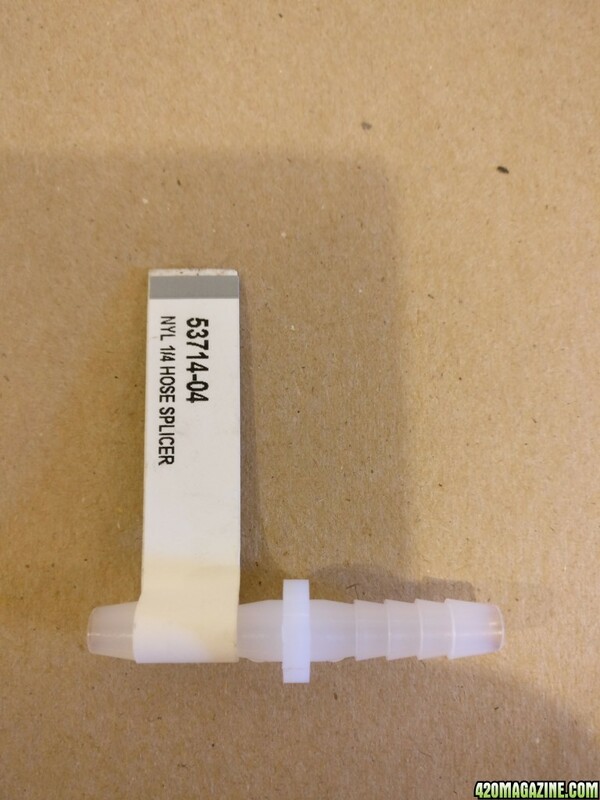 The lab calibrated wire depth gauge. 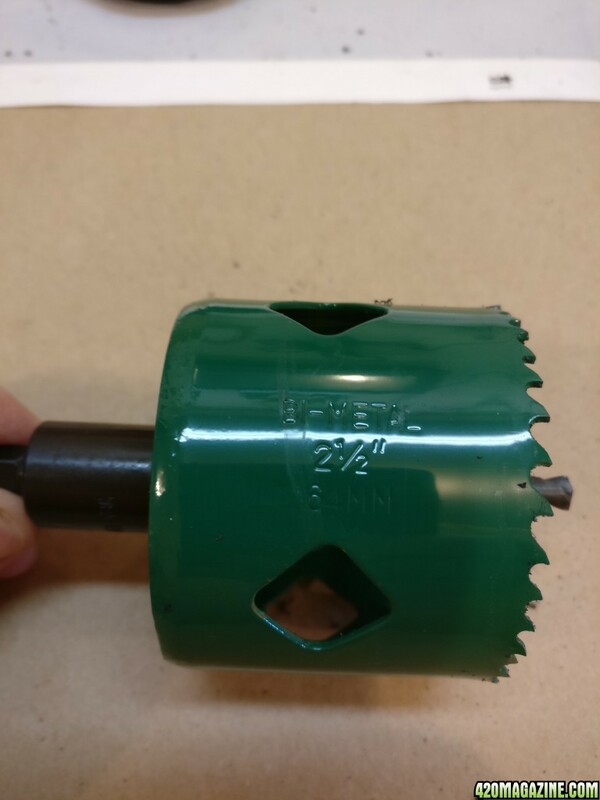 Hole cut in tote for Uni-Seal. 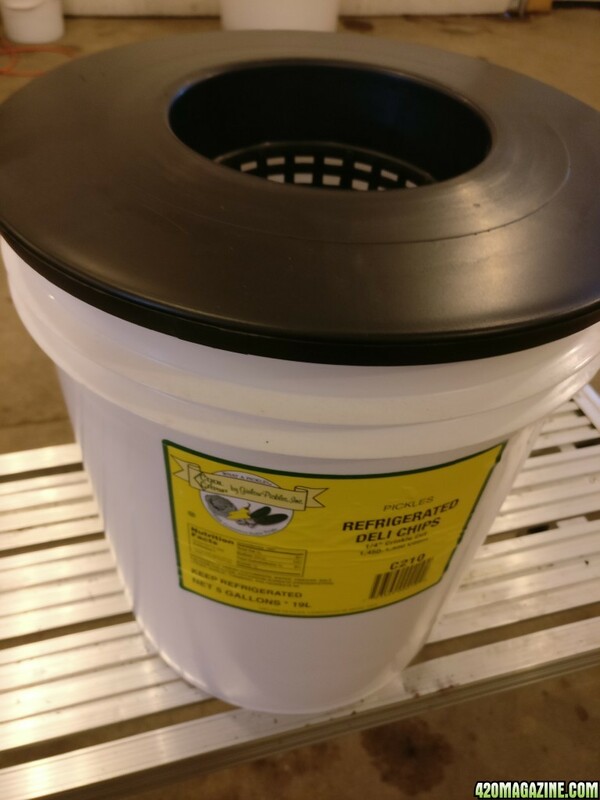 Net pot is made for a 5 gallon bucket. Its 6"diax 5"deep Net Pot. 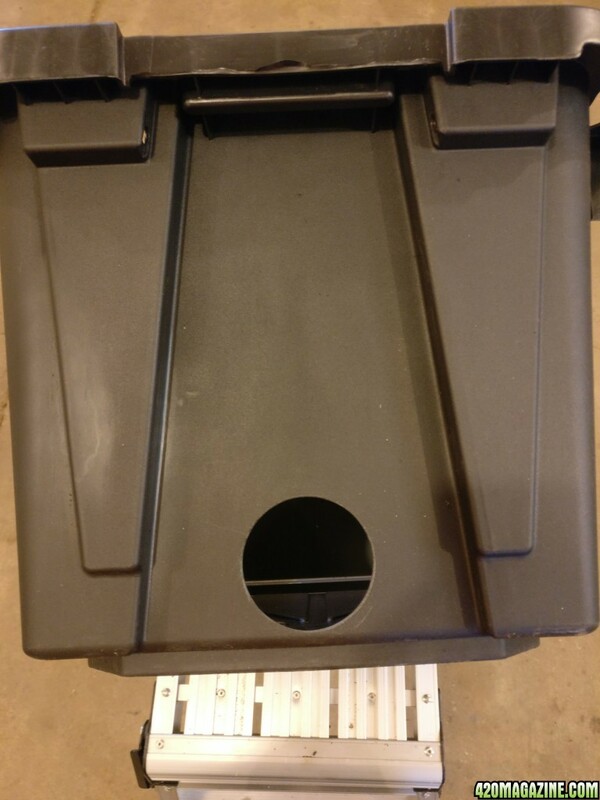 7" Bottom of Net Pot to bottom of bucket. 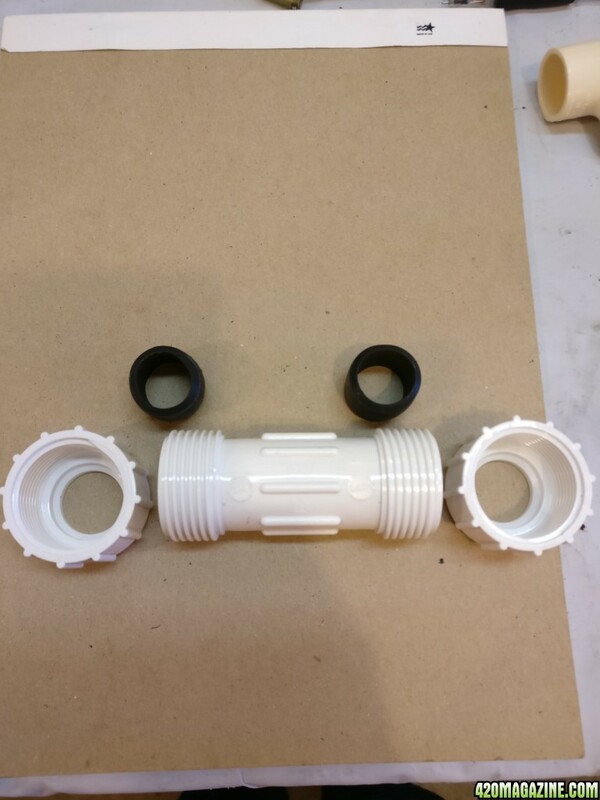 Bottom of 1-1/2" drain pipes is 1-1/8" off bottom. 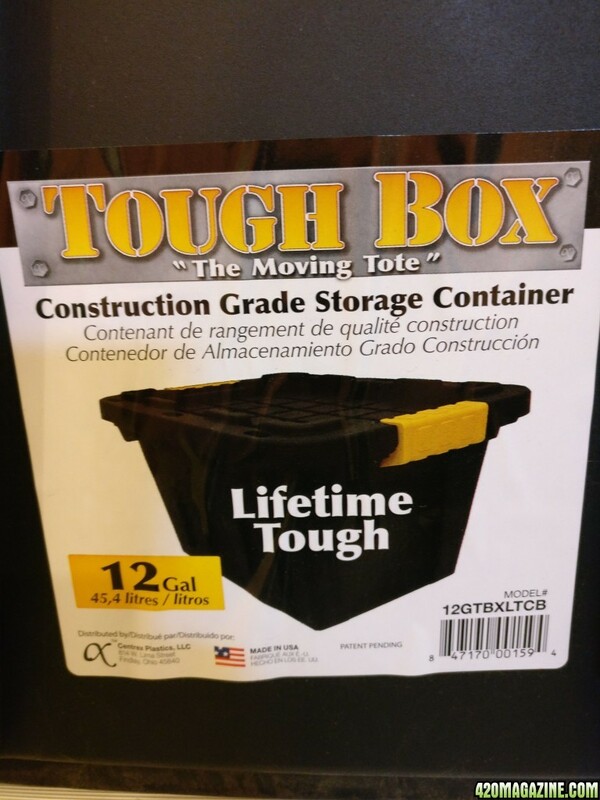 This will leave 1 gallon in container at drain/fluid change. Putting 1" of pea stone in bottom may take this down to 1/2 gallon at drain. Have to get some to try. Here is a quick peak at were its at now. I am thinking the water depth numbers should generate some thoughts. I am thinking of putting 1" or 2" risers under Net pots. On the old gad about this morning stopped by the nursery and picked up a bag of pea stone to do some testing with. Well I dumped some Pea Stone in bottom of the tote. Filled it up with water till it ran out the drains. Strained the stones out of the water and measured it. 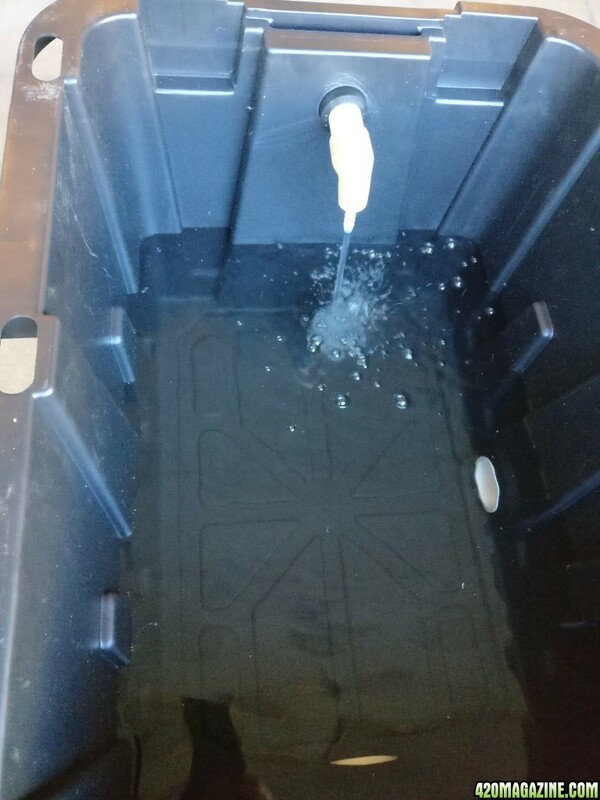 Wound up with just a touch over a quart of water that would be left in bottom of each tote with complete empty. Would need to place a screen over drains to make sure no stones make it to pump. I then dumped some in one of the Net pots...Hmmm Could this be used as a media. I added the quarter for size comparison. 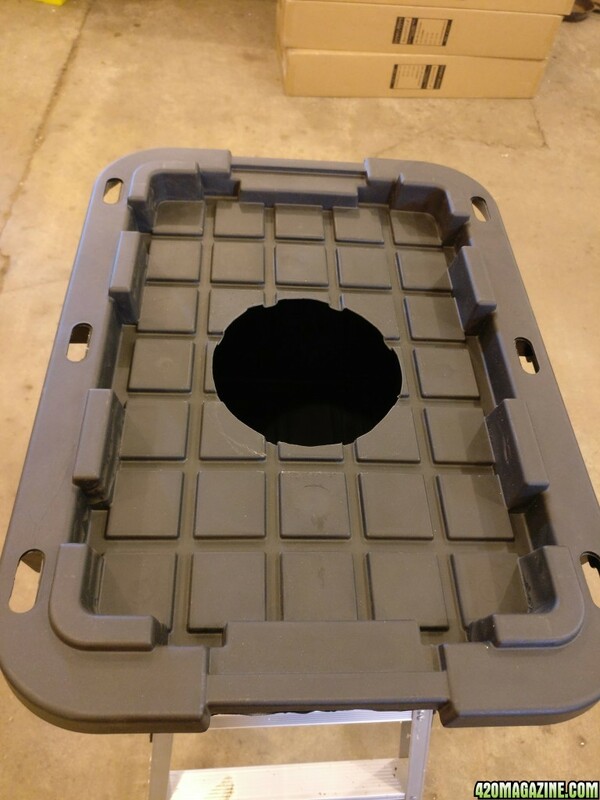 Thinking it would really help with light getting into container, but I plan on placing Reflectix on the top of each with holes just big enough for plant. 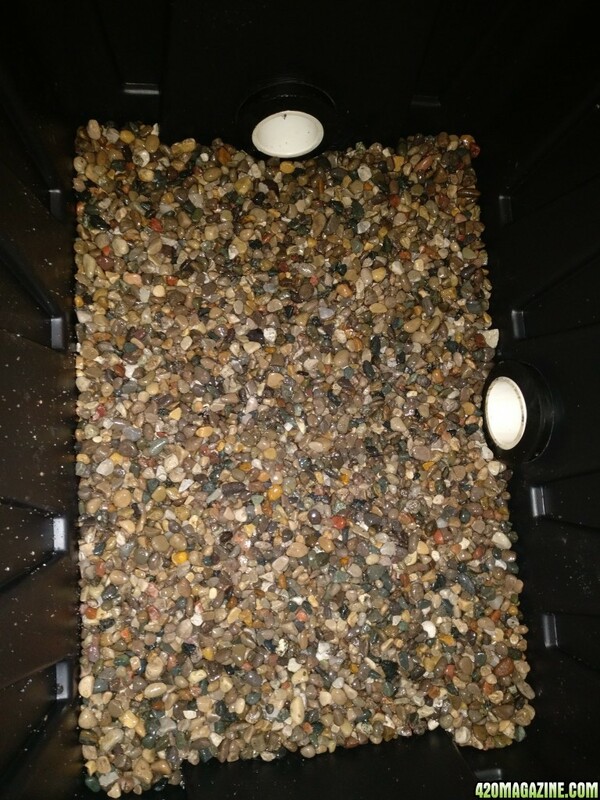 With the stones I would wind up with 1 gallon of old nutes left in system with a complete change out. Not a lot but is something to think about. Ok, I have a Danner 40122 pump coming next week. I have this one which is close in output. With having 4 sites I drilled 4 1/4" holes in the pipe and placed it on a stand off that has more head that what I will have when in operation. It may be hard to see in the picture but I feel it is going to work great. You have to imagine one of them jets in each site. I put 4 in stand off just so I could test all in one bucket. That is why I was trying to get as much out as possible. 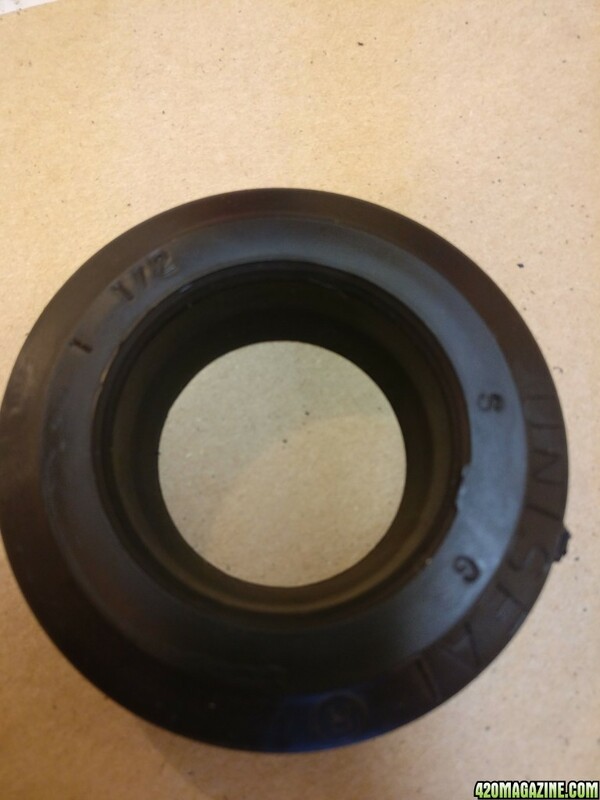 Unless the drain is in the low point like in a shower floor there is always going to be some left. All we can do is minimize it as much as possible. Off to get some pipe today to start working on the feed system. 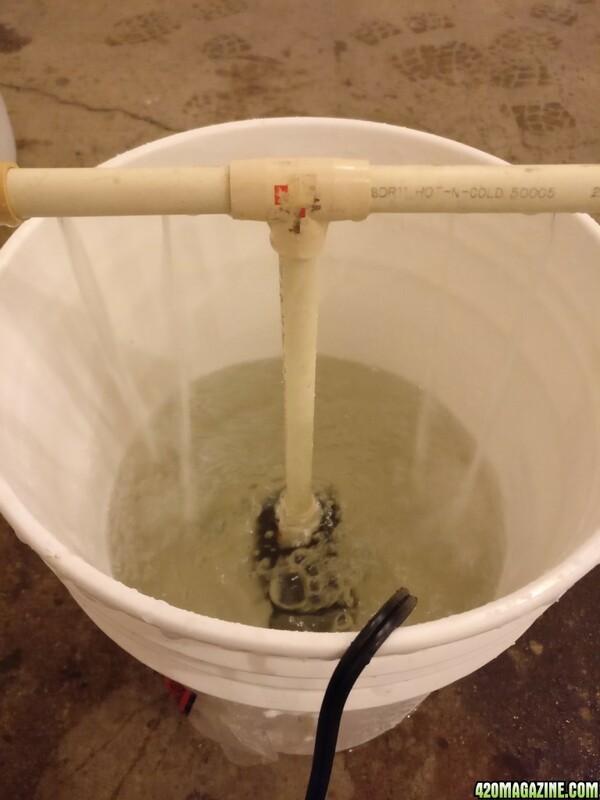 How I built nozzle for each site. 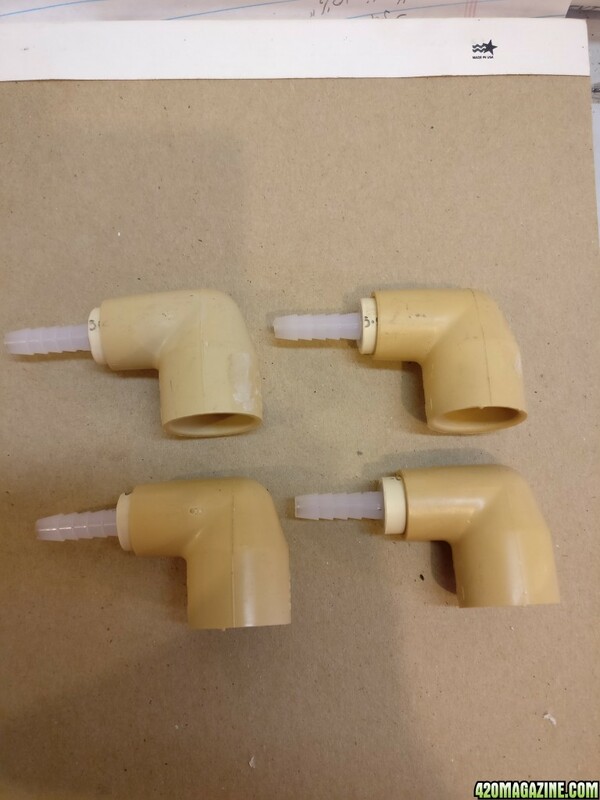 Hose barb for creating strong jet. 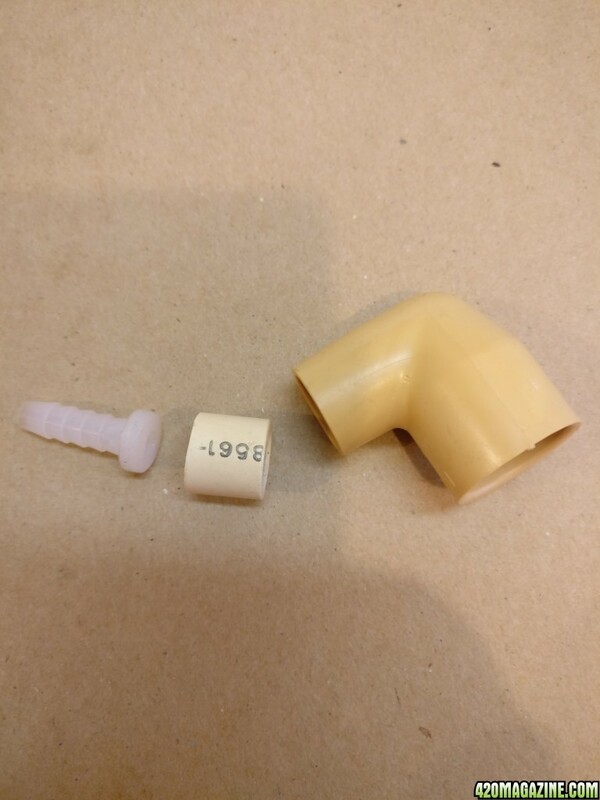 Cut a small piece of 1/2" pipe, sand outside of barb to fit within pipe. Cut one side of barb off and clean hole up. 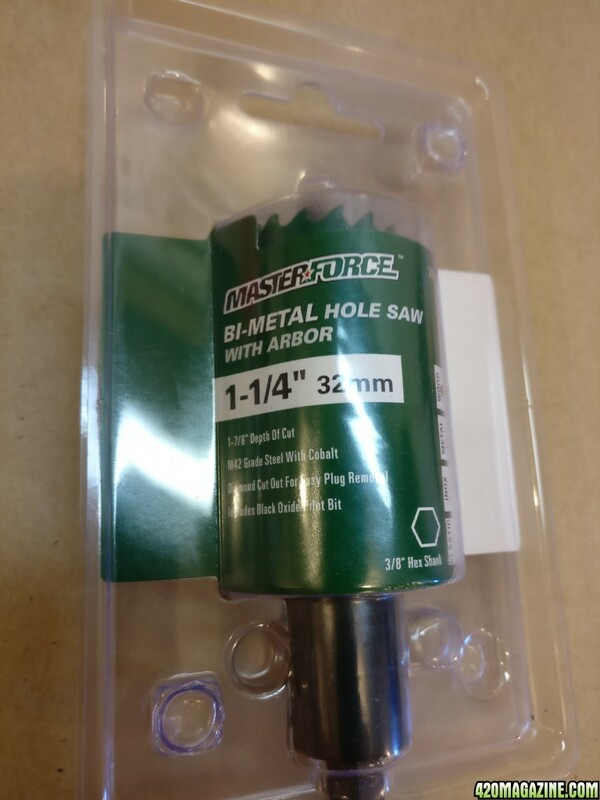 Here is the Hole saw for nozzle Uni-Seal. 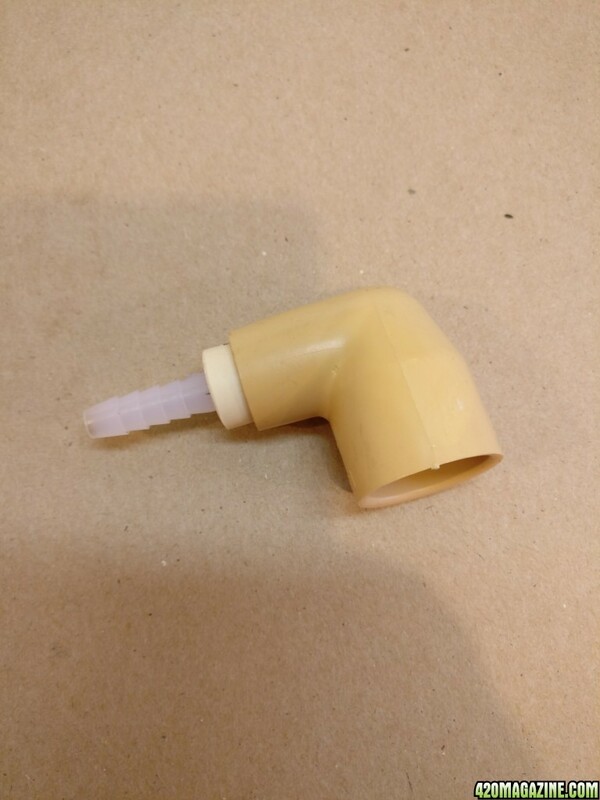 Here is the mock up of the nozzle in the tote. Here is the union I used to hook the pressure line together. 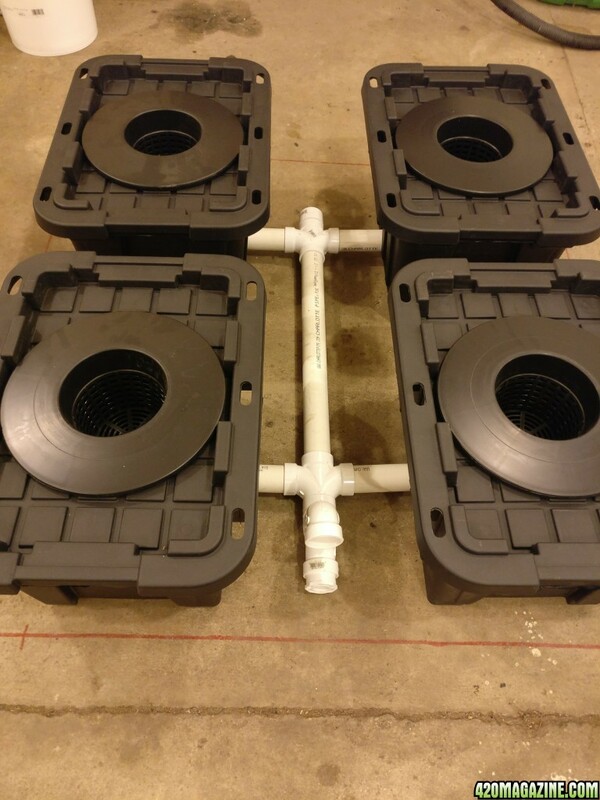 Here is the first trial test of unit minus the reservoir. 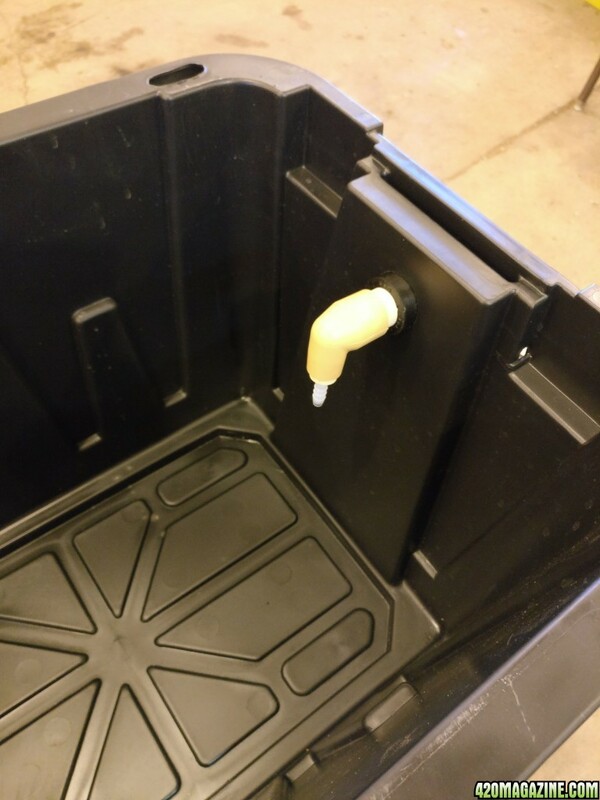 Threw the pump in one of the totes to check water levels while it was running. Here is a close up of one of the jets working. 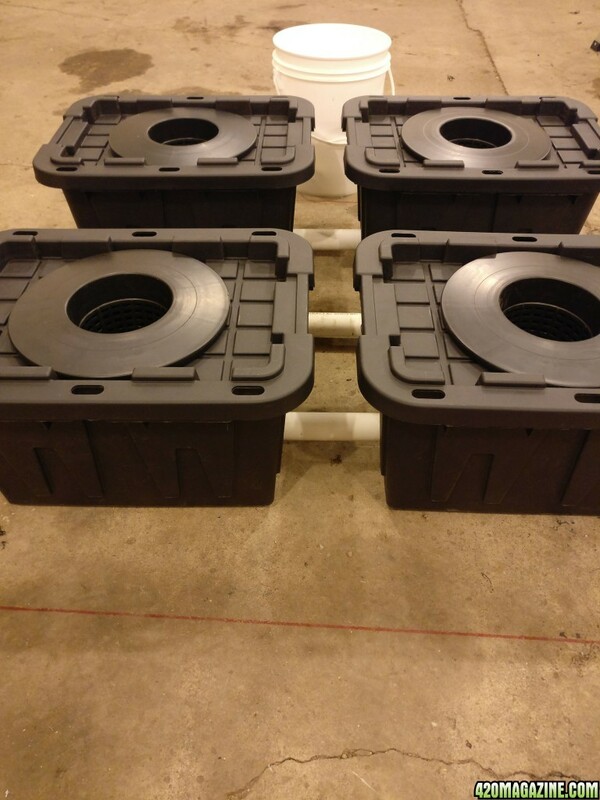 With water level at very bottom of bridge pipe each tote will hold 4-1/2 gallons of water. That places the water level 1-1/2" below the bottom of the net pot. I am expecting it to rise about 1/2" when fully hooked up. 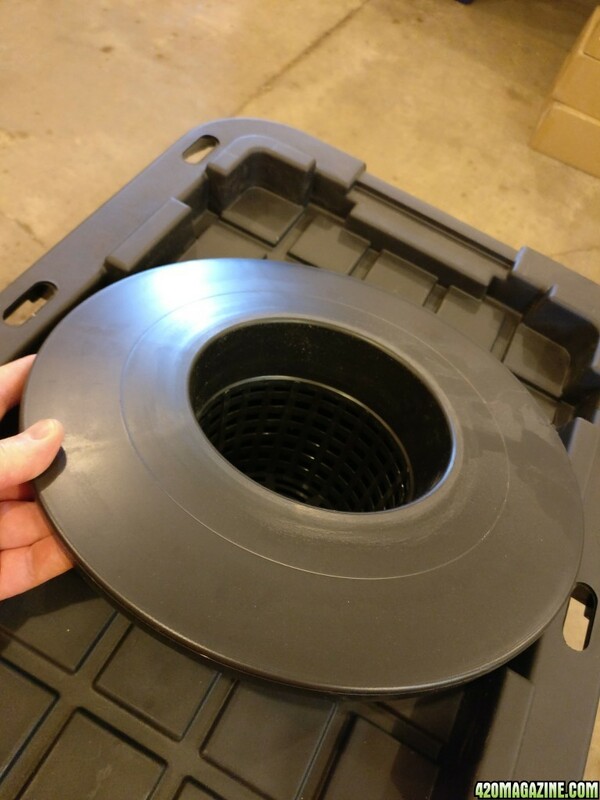 If that is to close I can place a spacer between the net pot and the lid of the tote. I don't think I will be using the pea stone in the bottom of the tote's as a volume eliminator. The thing I don't like about the system as it stands is the water that stays in during a drain. 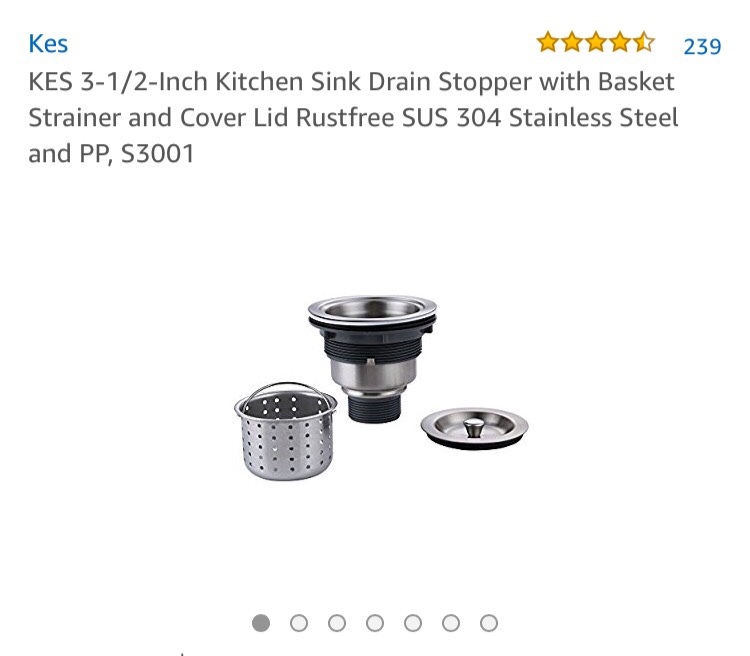 I am actively looking for different containers to use that will drain completely. If anyone knows of something I would like to see it. Yup, thats looking real real good. 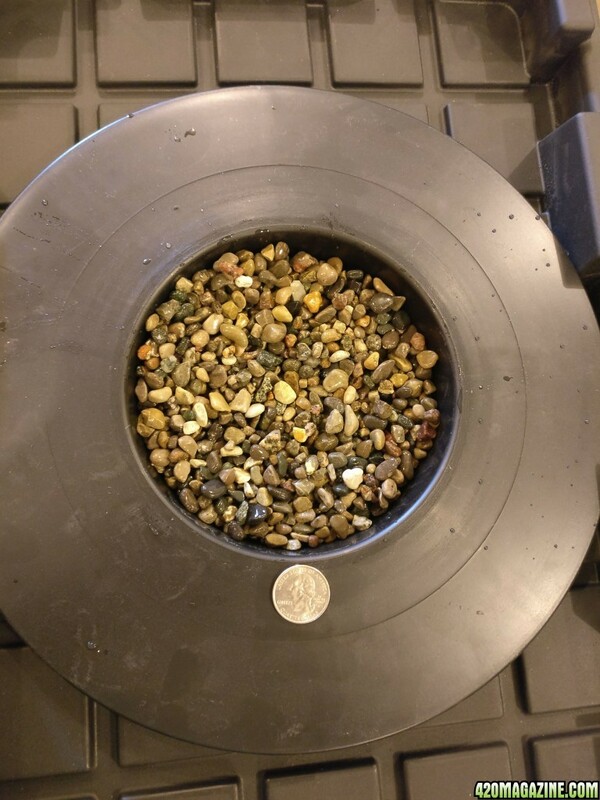 The 1/4" jets along with the air stones will probably give you a DO content well in excess of 500% of what the plants require. A case where more is better. I have the same issue with undrained fluid when I do a res change. Its never affected either grow but has always bothered me. 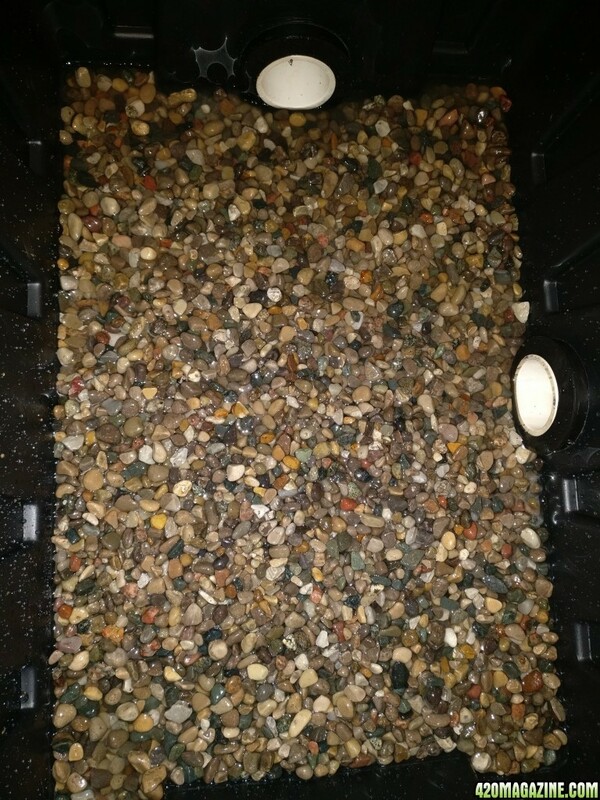 I'm liking your gravel idea and would steal it with your blessing. 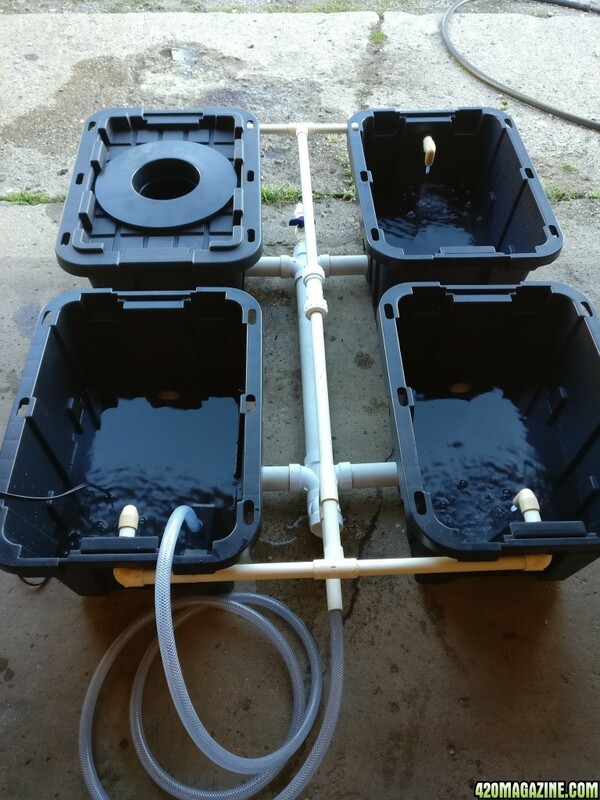 One thing I didn't do that I wish I would have, was put a valve on both the pump and return side down stream of the two front totes to be able to completely isolate the back two totes. 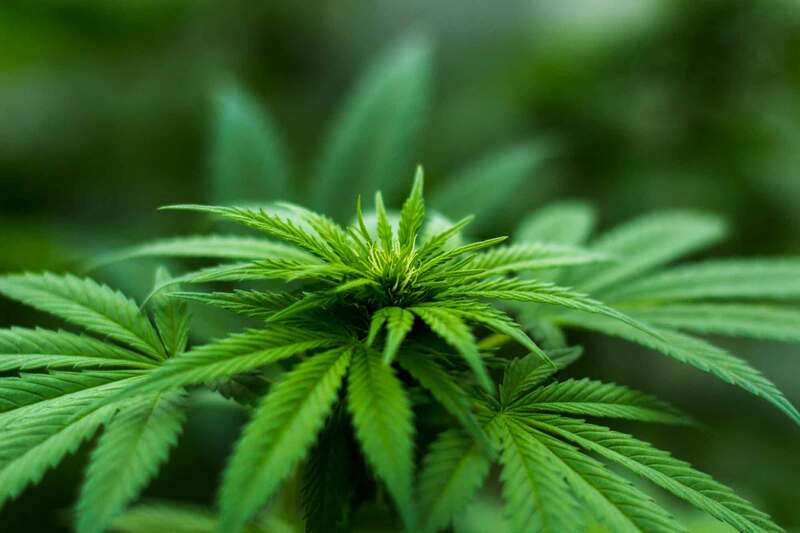 My thinking is, if I ever had two male plants or two deaths or whatever reason might cause me to finish a grow with two plants, I could isolate half the system to reduce water and nutes. Its worth considering. I'm really liking your DIY on this, I wished I had done similarly. That's where a wet vac comes in handy. 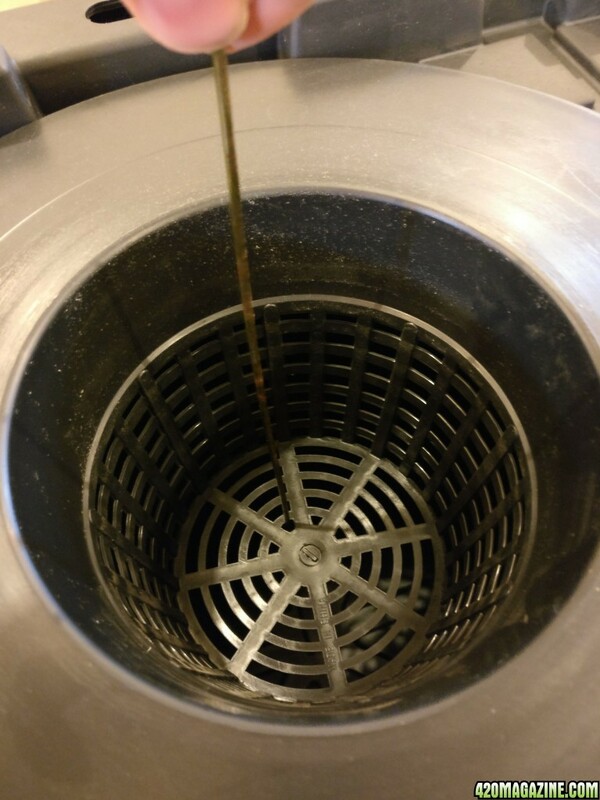 How about a drain in the bottom hooked to the system. Instead of out the sides. Scrogdawg could do this easy since his buckets are off the ground. I still think displacing the water to the bottom of the drain pipe is a good solution, if not pea gravel then maybe some other medium.